Volunteering for the Marine Mammal Stranding Network (MMSN) requires flexibility and a great sense of timing. 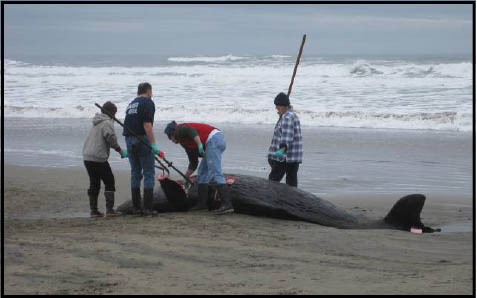 For normal strandings, Seaside Aquarium staff, the volunteers covering the Northern Oregon and Southern Washington coasts, must quickly assess the situation and make arrangements to dissect or dispose of a dead mammal or post signs to educate the public about a live one. This requires coordination with Debbie Duffield - Portland State University professor and head of the MMSN for the North Oregon Coast, city and local officials, MMSN volunteers, the media, and someone with the proper equipment to remove or bury a body. Unusual strandings require even more flexibility and coordination. Recent strandings of a live black sea turtle and a dead baby sperm whale had Aquarium staff scrambling to put the details together. 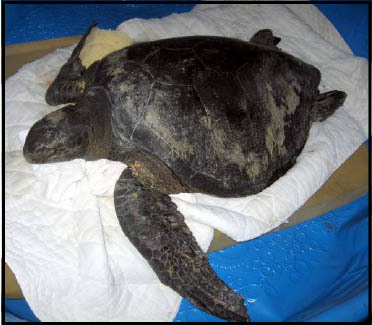 The black sea turtle washed up on the beach in Southern Washington on November 27 alive, but hypothermic. The Wildlife Center of the North Coast brought the animal to the Aquarium, who slowly warmed the turtle while coordinating with the Seattle and Oregon Coast Aquariums to determine next steps. The animal was sent to the Oregon Coast Aquarium for rehabilitation, and then to Sea World in Southern California (via Coast Guard plane) where it will recover until it can be released this summer. 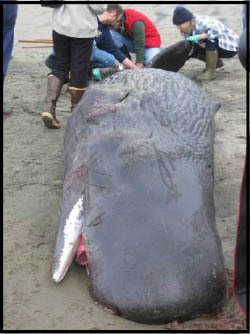 The fifteen-foot long baby sperm whale washed ashore in Tolovana, south of Cannon Beach. 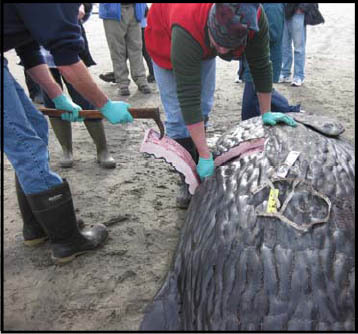 Aquarium staff quickly coordinated to dissect the animal before it was carried away by the tides. As the tide came in, the City of Cannon Beach provided equipment to help move the animal above the tide line. Two dissections were completed on this animal - one on the body to measure and remove various blood and tissue samples, and a more in-depth dissection of the head. Sperm whales grow to 40-65 feet long, with the head around one-third of total length. Because heads are so big on adult sperm whales, it has been difficult for scientists to study the structure. Jason Hussa, Aquarist for the Seaside Aquarium said, "It was really exciting, a unique opportunity to broaden our scientific base of knowledge." After the second dissection, the skull was taken to Portland State University for further study. Seaside Aquarium, 200 North Prom, Seaside, Oregon 97138 Tel: (503) 738-6211.